Meerkats are highly social and territorial animals. They live in colonies made up of different families, and there may be as many as 30 animals in a colony. In zoos they are sometimes dubbed the “piranha of the desert” because of their aggressive and tenacious nature. To protect the colony, one meerkat usually has sentry duty and the sentry will make several alarm calls if it senses a threat. 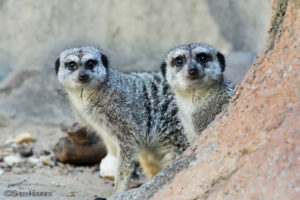 A meerkat colony may have several breeding females and males. Meerkat pups are born in burrows. The pups are often cared for by members of the group other than their mothers. Range: South Africa, Angola, Namibia, and southern Botswana. They live in dry areas, including deserts, and avoid forests and mountains. Meerkats can eat scorpions because of their immunity to its venom.